Portrait of Captain Henry Roberts by Thomas Gainsborough. Henry Roberts (1756–1796) was an officer in the Royal Navy who served with Captain Cook on his last two voyages. 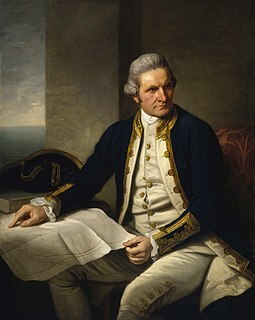 Roberts served as lieutenant on Cook's HMS Discovery, where he was entrusted with many hydrographic and cartographic tasks, and also met then-midshipman George Vancouver. Roberts spent many years after that voyage preparing the detailed charts that went into Cook's posthumous Atlas. Roberts also served on HMS Resolution where he was to make a painting of the ship. In 1790, Roberts was appointed to command a newly built HMS Discovery on another round-the-world voyage and selected George Vancouver as his first lieutenant. However, the Nootka Crisis called both men to duty elsewhere, and upon its resolution, Vancouver was given command of the historic voyage. Roberts died on 25 August 1796, Captain of HMS Undaunted in the West Indies, where he contracted yellow fever. Vancouver named Point Roberts after Henry Roberts. ^ Naish, John (1996). The Interwoven Lives of George Vancouver, Archibald Menzies, Joseph Whidbey and Peter Puget: The Vancouver Voyage of 1791–1795. The Edward Mellen Press, Ltd. ISBN 0-7734-8857-X. Wikimedia Commons has media related to Henry Roberts (Royal Navy officer). This biographical article related to the Royal Navy is a stub. You can help Wikipedia by expanding it. Captain George Vancouver was a British officer of the Royal Navy best known for his 1791–95 expedition, which explored and charted North America's northwestern Pacific Coast regions, including the coasts of what are now the American states of Alaska, Washington, and Oregon, as well as the province of British Columbia in Canada. He also explored the Hawaiian Islands and the southwest coast of Australia. Peter Rainier was a Royal Navy officer who served during the Seven Years' War, the American Revolutionary War and the Napoleonic Wars. From 1794 to 1805, Rainier was commander-in-chief of the Navy's East Indies Station, covering all seas between the Cape of Good Hope and the South China Sea. Captain James King was an officer of the Royal Navy. He served under James Cook on his last voyage around the world, specialising in taking important astronomical readings using a sextant. After Cook died he helped lead the ships on the remainder of their course, also completing Cook's account of the voyage. He continued his career in the Navy, reaching the rank of post-captain, commanding several ships and serving in the American War of Independence. Rear-Admiral Richard Charles Mayne CB FRGS was a Royal Navy officer and explorer, who in later life became a Conservative politician. Joseph Gilbert (1732–1831) was a British naval officer who was Master of HMS Resolution on the second voyage of Captain James Cook. As Master he was responsible for a number of specific duties, especially navigation.